The most important part of an organizational growth is its data. In case of a system failure, there is a need to restore the data. Back up is an exact copy of the database, which helps you to restore your data in case of any data loss. Consider a finance company which has data related to its customers such as A/C number, customer names, credit and debits, duration, etc. How would such an organization deal with the pressure of losing such important information in case of a data failure? This is the reason you back up the data so that in case of any failure of a disk, disk controller, etc. you can rely on the backup to restore it into the database. Physical Backups − Physical backup includes taking back up using third-party backup tools like Veritas Net Back, IBM Tivoli Manager or user manager backups using OS utilities. Logical Backups − Logical backup of database includes taking backups of logical objects like tables, indexes, procedures, etc. 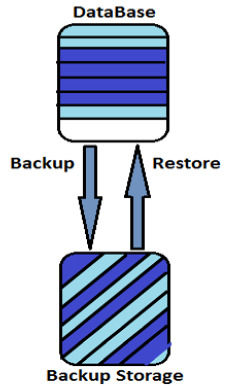 Example − One of common tool to take data backup is Oracle Recovery Manager (RMAN) that is an Oracle utility to take database backup. Target database for which backup is required. RMAN client is used to run commands to take data backup. If backup is in place for physical or logical objects of database. If regular backups are set up for invaluable data. If the backup tool meets the backup requirements of an organization.